For anyone with an interest in the origins and history of golf in Ireland, this book is a marvellous collection of over fifty rare period photographs of courses throughout the country. Fifty-one clubs are featured from Royal Portrush to Royal Dublin. 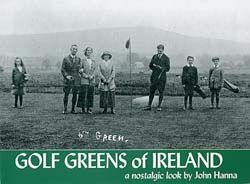 Each picture is accompanied by short histories of the clubs, researched and written by John Hanna, winner of the President's Prize for his contribution to the British Golf Collectors' Society.